Newcastle comfortably beat Crystal Palace to record their sixth win in eight games and keep pace with the Premier League's leading pack. The Magpies took the lead through Yohan Cabaye, whose deflected shot from close range beat goalkeeper Julian Speroni. They doubled their advantage when defender Danny Gabbidon inadvertently turned in Mathieu Debuchy's low cross. Hatem Ben Arfa completed the win when he smashed home from the spot after Jonathan Parr had fouled Shola Ameobi. Ben Arfa had also forced a good save from Speroni moments earlier, while fellow Frenchman Yoan Gouffran struck the woodwork with a great shot from 20 yards as the Magpies finished strongly. Palace manager Tony Pulis will be disappointed with his side's efforts at Selhurst Park - especially the first-half display - having impressed with two successive home wins since he took charge last month. The bottom-three side now travel to Aston Villa and also face a daunting trip to Manchester City over the Christmas period. Newcastle are in sixth and sit just six points behind the league leaders. Manager Alan Pardew - who was a key member of Palace's revival in the late 1980s - is seeing his squad begin to gel. The French legion that arrived in January have settled in, prized midfielder Cabaye is in his best form since joining the club, and in Loic Remy they have one of the division's leading marksmen. At a rain-swept Selhurst Park, they recorded their fifth away win so far - having managed only two last season - with a dominant performance. After a non-eventful opening period, Newcastle took the lead through Cabaye. The 27-year-old, who missed last week's 1-1 draw against Southampton, scored his fourth of the season when his shot from 10 yards flew in via a slight deflection off Mile Jedinak. Palace tried to hit back immediately and it needed a good save from Tim Krul to deny Cameron Jerome and Vurnon Anita cleared off the line after team-mate Mike Williamson had unwittingly sent the ball goalwards. Pulis's men then suffered their second blow when Debuchy fired in a fizzing cross from the right that Remy gave up on but Gabbidon poked past his stranded keeper. The former Stoke boss made two changes at half-time - bringing on winger Yannick Bolasie and Parr - but aside from a wild Jerome volley from seven yards, the Eagles failed to threaten the Magpies goal. Newcastle brought on Ben Arfa. A peripheral figure this season, he added energy to the Magpies attack and went close before tucking away his penalty four minutes from time after Ameobi had been pushed over. Pardew's side now have home matches against Stoke and Arsenal over the festive period. "Not many teams are going to come here and win 3-0. "I'm delighted with the players - they were terrific. The key was to control possession and make sure the ball didn't come into our box. "Cabaye made a difference. His contribution was important - he gave us the x-factor. Ben Arfa gave us that. [Fabricio] Coloccini and Debuchy were immense, as was [Cheick] Tiote. I don't put Cabaye above the others. "Five wins away says we have a good spirit. It's difficult to break us down and we score goals in open play." "The two goals we conceded were poor. "The one thing we have been since I came here is pretty solid and disciplined in coping with most things, but today we have gifted them two poor goals. "From that point onwards we are chasing the game against a team I feel will finish in the top eight. "You have to do well at home. The next two games at Villa Park and Man City will be tough, tough games so we have to do well here and we can't be gifting teams goals." Match ends, Crystal Palace 0, Newcastle United 3. Second Half ends, Crystal Palace 0, Newcastle United 3. Attempt missed. Joel Ward (Crystal Palace) header from the centre of the box is too high. Assisted by Jason Puncheon with a cross following a set piece situation. Attempt saved. Damien Delaney (Crystal Palace) left footed shot from outside the box is saved in the centre of the goal. Assisted by Marouane Chamakh. Corner, Newcastle United. Conceded by Daniel Gabbidon. Goal! Crystal Palace 0, Newcastle United 3. Hatem Ben Arfa (Newcastle United) converts the penalty with a left footed shot to the top right corner. Penalty Newcastle United. Shola Ameobi draws a foul in the penalty area. Penalty conceded by Jonathan Parr (Crystal Palace) after a foul in the penalty area. Foul by Shola Ameobi (Newcastle United). Marouane Chamakh (Crystal Palace) is shown the yellow card for a bad foul. Davide Santon (Newcastle United) wins a free kick in the defensive half. Attempt blocked. Davide Santon (Newcastle United) right footed shot from outside the box is blocked. Assisted by Cheick Tioté. Corner, Newcastle United. Conceded by Julian Speroni. Attempt saved. Hatem Ben Arfa (Newcastle United) left footed shot from the centre of the box is saved in the bottom left corner. Assisted by Yoan Gouffran. Yoan Gouffran (Newcastle United) hits the left post with a right footed shot from outside the box. Assisted by Hatem Ben Arfa. Substitution, Newcastle United. Hatem Ben Arfa replaces Yohan Cabaye. Attempt saved. Yohan Cabaye (Newcastle United) right footed shot from the left side of the box is saved in the bottom right corner. Assisted by Moussa Sissoko with a through ball. Substitution, Crystal Palace. Dwight Gayle replaces Cameron Jerome. Offside, Crystal Palace. Julian Speroni tries a through ball, but Cameron Jerome is caught offside. Substitution, Newcastle United. Shola Ameobi replaces Loïc Remy. Foul by Mathieu Debuchy (Newcastle United). Cameron Jerome (Crystal Palace) wins a free kick in the defensive half. Offside, Crystal Palace. 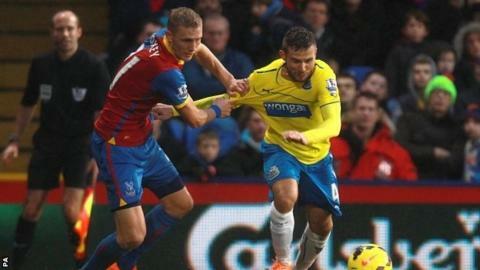 Yannick Bolasie tries a through ball, but Damien Delaney is caught offside. Jonathan Parr (Crystal Palace) wins a free kick on the left wing. Attempt missed. Yohan Cabaye (Newcastle United) right footed shot from the left side of the box misses to the right. Foul by Loïc Remy (Newcastle United). Attempt missed. Cameron Jerome (Crystal Palace) left footed shot from the centre of the box is too high. Assisted by Mile Jedinak with a headed pass following a set piece situation.